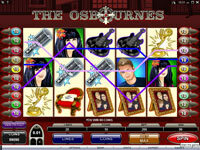 Although the Osbournes is at heart just a rebadge of Microgaming's standard 5 line video slot plus a bonus trail combined with the free spins feature. This is never the less one of Microgaming's better attempts at creating a fun video slot, the music and light hearted theme of the game makes a surpisingly fun blend. The door knocker symbol appears on the first three reels. If you spin in 3 of these symbols you can then pick one of them to reveal a hidden bonus multiplier. The bonus is activated by spining in 3 dog symbols (note these appear on all 5 reels). Once activated you recieve 10 free spins, the twist with this is a feature trail which appears above your reels. 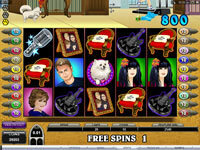 For every dog symbol which appears on the middle 3 reels (2,3 & 4) during the free spins your dog will move 1 space. Every 10 spaces is an Osburne family member who will give you a bonus and another 10 free spins!